Editing: It’s back to the drawing board. Amazingly the agent I approached viewed my sample chapters straight away, but the answer was negative – not interested – but might consider again if I undertake a lot of work. The suggestions were helpful and I’ll rework the novel again with some of them strongly in mind, and think some more about others. Am leaving that till next week. Writing: I’m working on two short stories for our next anthology – there needs to be a twist. That is a challenge, but an item I read in a weekend supplement last week and an internet story I stumbled on have provided inspiration for family oriented tales – that is not a surprise for me. One focuses on the early stage of life, the other on the later stage – this isn’t new either – in one theme of our Ten Minute Tales anthology the same beginning and life end matters found their way to the top of consciousness. Is that what being the eldest of seven does? Reading: Mainly focused on books the library will want to have back on the shelves again soon. Would love to keep Caleb’s crossing by Geraldine Brooks a while longer, to savour it. Denise Leith’s book What remains is another I will dip into several times before returning. Am also reading a local author Paula Watson’s YA story Shadows (about love, nightmares, angels, war) since hearing her speak about it at a local Author talk run by Redlands Libraries – had to wait a while for it as I was well down the ‘request’ list. Very clearly and well written; I’m enjoying the read even though fantasy type writing is not a preferred genre. There are some books piling up that I couldn’t resist buying as well and I’m thinking of reviewing some indie titles on Smashwords or through Library Thing. Should keep me out of mischief. Won’t slow down the new writing though as reading is an evening activity. Colleagues: Nene, a member of our Writers Group is busy working on her novel on advice from an e-publisher. I wish her well. Keep up with progress on her blog at nenedavieswrites.weebly.com Another member is also on the brink of submitting a novel for consideration as well. It’s a big step to let go. Thoughts are with her as she makes that decision. 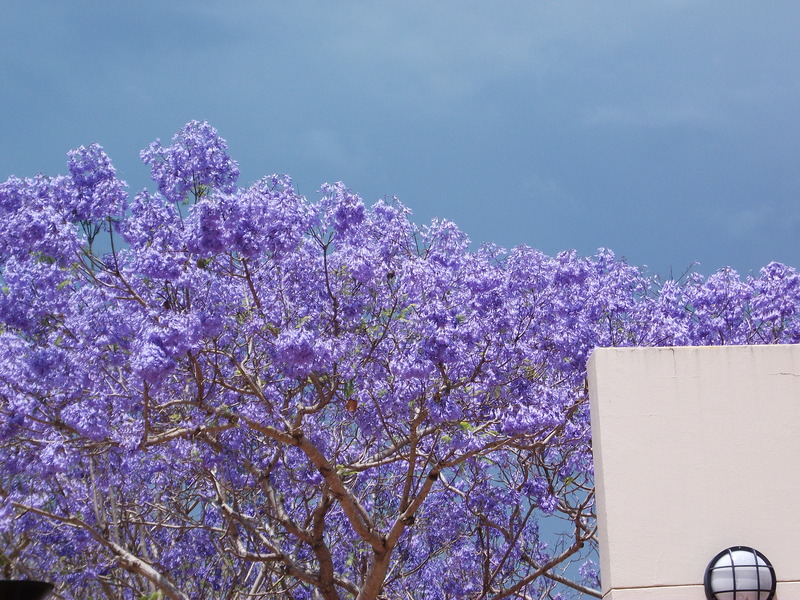 The jacaranda are still magnificent.